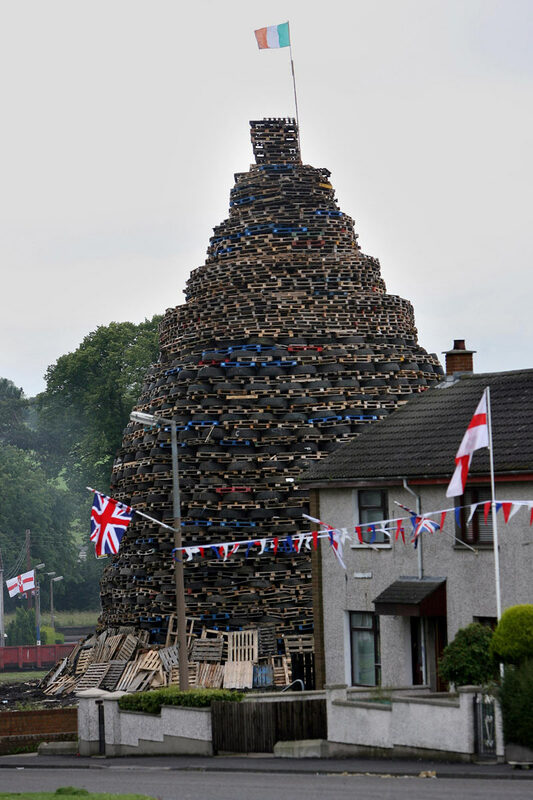 Northern Ireland Loyalists (those who wish for NI to remain part of the UK) have created a pyre made of tyres that will be burnt tonight to mark the Williamite victory in the Battle of the Boyne against the Jacobites in 1690. The Jacobites were supporters of the deposed Catholic King of England (with Wales), Scotland and Ireland James II, whereas the Williamites were the supporters of Protestant King William III. A Republic of Ireland flag sits at the top of the pyre and will also be burnt. Stacked by their thousands, the tyres in this tower cast a long shadow over nearby houses. The four-storey pyre is due to be set alight tonight at the start of loyalist celebrations of the Battle of the Boyne. But some locals in Ballycraigy, County Antrim, Northern Ireland say the man-made mountain of tyres and pallets is a major risk to health and should be dismantled. They say it could collapse dangerously and give off toxic fumes when on fire. British and Northern Irish flags flutter whilst, at the top of the pyre, a Republic of Ireland flag that will be burnt. 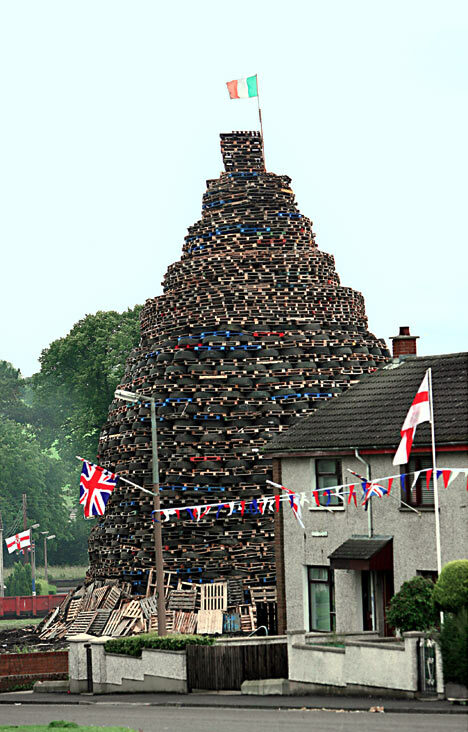 The pyre was built by the pro-British Loyalists in Northern Ireland as part of their celebrations of the 1690 Battle of the Boyne, when forces allied to the Protestant King William III (the Williamites) defeated the Jacobite supporters of the Catholic King James II. Safety barriers have been erected around the pyre which has been built with the help of wooden pallets. The pyramid is topped by an Irish tricolor. Bonfire committee workers have already removed tyres from seven of the nine bonfires in the area on safety grounds.